I’m briefly venturing away from picture books and starting with Jasper and the Riddle of Riley’s Mine by Caroline Starr Rose. This is a middle grade adventure about two brothers who escape their abusive father and join the Klondike gold rush of 1879. This story saves most of its coziness for the very end, but it’s an exciting read with a bit of mystery. 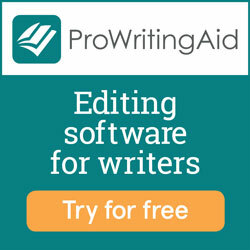 Though the story is fictional, the author includes an interesting note at the end that gives a few more details about the real-life characters and circumstances included in the novel. This book is geared toward children in grades 4-7. Although the boys leave their rough home life by the end of the first chapter, those circumstances continue to provide context throughout the story. The brothers also face some other perilous situations along their journey. If your child is on the younger side of the recommended age range, you may want to read at least the first chapter and decide whether or not you think her or she is ready for it. Of course, if you enjoy this book as much as I did, you may find it hard to quit reading after just one chapter. 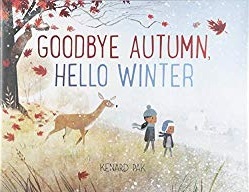 Although autumn is long-gone for most of us, I wanted to be sure to mention Goodbye Autumn, Hello Winter by Kenard Pak. I told you about his book Goodbye Summer, Hello Fall in my fall library list, and this one is just as delightful. I especially enjoy the way the story follows two children on a walk that takes them from the countryside into town, through a bustling city street, into their home, and back again, all while autumn leaves blow away and winter snowflakes arrive. Whether your family lives in the country, city, or suburbs, your children will likely see a glimpse of the familiar in this book. 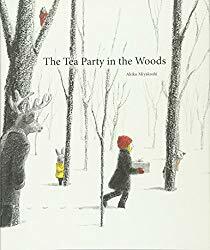 I love the way The Tea Party in the Woods by Akiko Miyakoshi starts simply and quietly as Kikko walks through the snowy woods to her grandmother’s house. We get a tiny hint of the magic to come as the girl nearly catches up with her father just as he enters a mysterious house. When Kikko goes to investigate, she is thrust into a tea party that’s easily one of my favorite storybook depictions of hospitality. There’s also pie and a parade, so this is basically a book about my favorite things. Wolf in the Snow by Matthew Cordell is another book about a little girl who encounters someone unexpected in the snowy woods. The only words in the story are the sounds the girl makes and hears on her trek. My four-year-old and I enjoyed looking at this book together, talking about what was happening, and guessing what would happen next. We meet lots of farm animals who are hunkering down during winter’s first snow in A Home in the Barn. Caldecott Medalist Jerry Pinkney illustrated this previously unpublished book by Margaret Wise Brown. My boys loved studying the pictures on each page and discovering the details in and around the cozy, crowded barn. 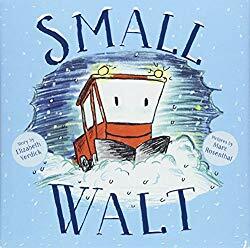 Finally, if you have any vehicle-obsessed kids in your life, they will love these two books: The Little Snowplow by Lora Koehler and Jake Parker and Small Walt by Elizabeth Verdick and Marc Rosenthal. As you likely guessed, these books are about tiny snowplows with big hearts (engines?). Although they are very similar, the books are different enough to both be worth checking out. If you read both of them, I’d love to hear which one your family likes best. What favorite winter books would you add to this list? Let me know in the comments!